Crown Oil are proud to announce we will be continuing as jersey sponsors for Rochdale FC for the 2016/17 season. Their new home and away kits which are shown here are modelled by team members Oliver Lancashire and Calvin Andrew, scoring 7 goals between them this season and making 69 appearances combined. The kits are now available to purchase from the club’s shop. You can choose from a range of sizes available and order securely online. It has been an exciting season for Rochdale FC and the team is well established in League One under Keith Hill’s management. The Dale are in a respectable position to push on next season and aim higher to make even further progress. 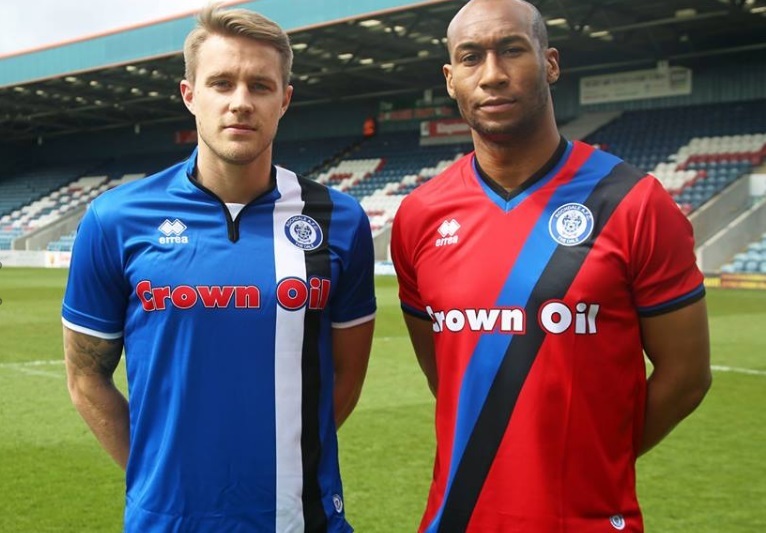 Playing many games around the country throughout the season, Rochdale FC and Crown Oil are aiming to enhance our names. As usual, we will be closely following the team’s progress and wish all the players and staff the very best with another successful season ahead. Visit the Dale when the 2016/17 season commences in August and roar the team to success. The club is known for its friendly and fun atmosphere as well as its loyal supporters who passionately follow the matches week in, week out. It’s great to see a local team doing so well and the Dale are well supported here at Crown Oil, with many employees being close supporters. We look forward to next season and our national promotion through the close association with Rochdale AFC.